The Oh Really » Taming the Beast. Corner of Saint Mary and Belmont. | Home | I’m Pretty Sure None of These People Read My Website. Today Larry officially got fed up with the status of our closet, which had reached crisis mode. The pile of shoes at the bottom was so big you had to anchor your hand on the doorframe, then swing in in order to get any actual, you know, clothes, because there was no stepping inside the beast. Those orange things are slippers, I swear. This entry was posted on Sunday, July 16th, 2006 at 9:16 pm and is filed under sally. You can follow any responses to this entry through the RSS 2.0 feed. Both comments and pings are currently closed. Why does it appear that Larry has more shoe-storage than you? This seems to defy what I thought I knew about male:female relations. 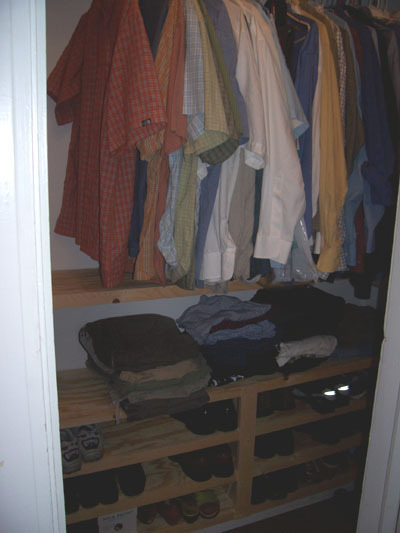 Oh, I miss having big closets. Our house is old, so there’s not a TON of closet space, but I’m guessing it’s more than the typical NY apartment. 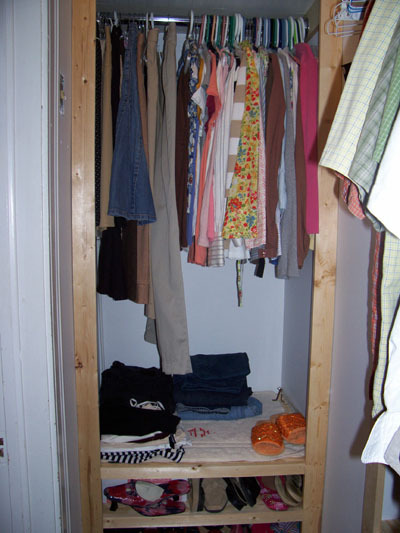 And now you can actually go in, close the door, and change clothes without a panic attack. Pete enjoys the shelves as well.